Catharine (Minerd) Ream was one of a dozen children of Jacob and Maria (Nein) Minerd Sr., and only after many years of research has been identified by name. She was the second of three wives of widower John Ream (1764-1839), originally spelled "Rihm," a farmer whose land later became the town of Ursina, Somerset County, PA. Whether she may have been wed to someone before Ream is unknown. At her marriage to John Ream, she became the step-mother to three and possibly four children -- Thomas Ream Sr., Samuel W. Ream, Catherine Jennings and Mary Anne Weyand, Still in question is whether Catharine may well have been the mother of the fourth child, born after the demise of John's first wife. The main reference to Catharine in the known recorded annals of published history is a paragraph about her father in the 1882 book by Franklin Ellis, entitled the History of Fayette County. The sentence reads as follows: "Another of Minerd's daughters married John Ream, the founder of Ursina village, in [Somerset] county." John was the son of Andrew and Susana (Fiesser) Rihm. The father served in the American Revolution as a captain of the 2nd Company, 3rd Battalion of Lancaster County Militia. John's grandfather reputedly immigrated to Pennsylvania with William Penn in 1683. According to the book Draketown Past & Present, John's parents came to southwestern Pennsylvania in 1763 and settled on the land which eventually became Ursina. The father "very early erected a stockade at his cabin for protection," according to the February 1963 issue of the Laurel Messenger newsletter of the Historical & Genealogical Society of Somerset County. Several sources, including the Clark County (IA) History, erroneously state that John rather than his father Andrew served as a soldier during the Revolutionary War. On Sept. 21, 1787, the Commonweath of Pennsylvania granted Andrew a tract of 286 acres called "Long Bottom" which sat on the north fork of Turkeyfoot Road near the mouth of Lick Run. He in turn deeded 70½ acres to David Ream and the balance of the 215½ acres to his sons Jacob and Samuel on May 10, 1802. Andrew Ream (the name was originally spelled Rihm) is believed to have come to the Turkey-Foot region in 1763. He was born in 1737, and died in 1818. His farm was the land on which the town of Ursina now is. Samuel, the last survivor of the family died several years ago. The grandfather of Andrew Ream came to Philadelphia with William Penn in 1663, and built fourteen houses in the town. 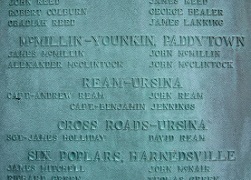 John Ream was probably born in Loudoun County about 1759. Early in life he came to Turkey-Foot and lived upon the Ream farm, where Ursina now is. He died in 1839. He was married three times. His first wife died in 1792. 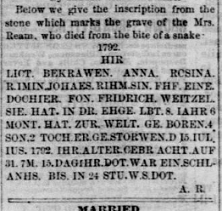 The following is a translation of the German inscription upon the stone erected to her memory in the old graveyard below Ursina: " Here lies buried Anna Rosina Ream, wife of John Ream and daughter of Frederick Weitzel. In her married life of eight years and six months she bore four sons and two daughters. She died July 15, 1792. Her death was caused by the bite of a snake; in twenty-four hours she was dead." Of the children of John Ream, Thomas, Samuel, Catharine (Jennings) and Mary (Weyant) reached mature years. 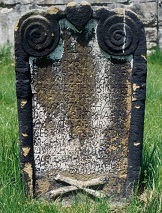 Anna Rosina's grave marker was carved by her son Samuel after he became an adult. At one time it was the largest marker in the Ream Cemetery. Many years later, in August 1929, the Meyersdale Republican reported: "The decorations are very quaint. At the top of the stone, on the front, a heart is carved; a circular scroll is carved on each side of the heart, terminating in a raised place all the way down to the bottom of the stone.... At the bottom of the stone, below the inscription, cross bones are carved. On the back of the stone a six-pointed star is at the top, with the face and wings of an angel below. The same raised place as on the front is on the back, the carving is supposed to represent a snake. A little vine is carved on each end of the stone. "The inscription on Anna Rosina's grave marker was translated by Nelle Brocht and published in the same Republican article. Ursina … occupies the site of the Ream farm, and was the point of one of the earliest settlements in the Turkey-Foot region. Evidences of Indian occupation are abundant. Arrow and spear heads and other stone implements of the aboriginal race are frequently found, even at this day, in the soil along the river. There is a tradition that the settlers once had a sort of rude fortification on the bank of the stream near the lower end of the town, close beside the tree that bears the name of “The Fort Oak.” There is evidence that this was actually the case, a part of the works still being visible, while some of the logs, covered by the water of the river, are tolerably well preserved. The "Fort Oak," also known as the "Charter Oak," was the site of an early stockade which protected settlers from Native American Indian attacks. The fort was said to have been connected to Laurel Hill Creek by an underground passageway so that the settlers could obtain water without becoming exposed to danger. The oak is said to have measured 16 feet in circumference and to also have functioned as an observation post. By deed dated March 21, 1805 John paid £575 to acquire 215½ acres of his father's land from his brothers and their wives who had acquired it a few years before -- Jacob and Susanna Ream and Samuel and Elizabeth (or "Rachael") Ream. There were stands of white walnut, white oak, sugar and beech trees. The acreage bordered the properties of Benjamin Jennings, Jacob Rush and Andrew Ream and, according to the deed, touched on the "south side of the north fork of Turkeyfoot, thence by the land of Andrew Ream and down the north fork by Hogback Mountain" and thence to the "north side of the north fork." That same day, at a purchase price of £300, John also purchased another 91 acres (out of 112) from his brothers, a parcel called "Copeland" and seated on the north fork of Turkeyfoot. This tract held walnut, white oak, beech, sugar and black oak. It sat on the north side of the north fork of Turkeyfoot, including a point on Hogback Mountain, along the lands of John Smith, David Ream and Robert Love. During a three-year span from 1819 to 1822, John was involved in four lawsuits in Somerset County. He was the plaintiff in cases involving Jonas Hartzell (#111 May Term 1821) and James Wright (#215 May Term 1821 and #6 December Term 1823). He was named as a defendant in complaints brought by John Coffroth (#33 August Term 1819) and Lewis Mitchell (#141 May Term 1822). The outcome of these matters is unknown. Ursina received its somewhat fanciful name from the fact that it was laid out by Hon. William B. Baer, now the president judge of this district, and who at that time owned the land on which the town was plotted. [Ursus (Latin) signifies bear.] The town was laid out in 1868, H.L. Baer and R.J. Botzer being the surveyors.... The first blacksmith-shop was built by Judge Baer, in 1868. John Anderson was the first blacksmith. The same year Judge Baer erected a sawmill, which was in operation for several years. 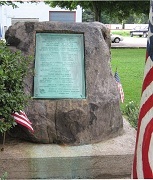 Tablet at Confluence, PA, dedicated in memory and honor of the Revolutionary soldiers known to rest in Turkeyfoot region cemeteries, including John Ream, his father Andrew and Capt. 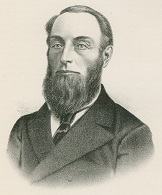 Benjamin Jennings. John is known to have been married three times. He wed his first wife, Anna Rosina Weitzel ( ? -1792), on Oct. 10, 1785 in Reamstown, Lancaster County, PA before migrating to Somerset County. According to the Reflections booklet, John and Anna Rosina had seven children, including the four who lived to adulthood, as well as three who died young -- John Ream, Christina Ream and Samuel Ream. Their son Samuel W. and possibly all of their children were born on the family farm in what became Ursina. Here lies buried Anna Rosina Ream, wife of John Ream and daughter of Frederick Weitzel. In her married life of eight years and six months, she bore four sons and two daughters. She died July 15, 1792. Her death was caused by the bite of a snake; in twenty-four hours she was dead. Anna Rosina's grave, with a transcription of the epitaph as published in 1885 in the Somerset Herald. Below, the cemetery sign circa 2016. Catharine, 1822, which she signed with an "X". Our Catharine became John's second wife sometime between 1792 and 1822. Her first name -- the only known instances in which it is recorded in writing -- is found in Somerset County Deed Book 10, pages 302-304 and 371-372, involving deeds of land to their son-in-law David Jennings. The first of the 1822 deeds involved 182 acres of land originally patented to Samuel and Mary Skinner by the Land Office of the Commonwealth of Pennsylvania (Patent Book H, Vol. 13, page 96). John in turn had acquired the acreage on Feb. 1, 1817 and bordered on the propertis of David Woodmancy, Elijah White, Stewart Rowan, Robert Skinner (in right of Nathaniel Skinner) and James Tannehill and held white oak, black oak and maple trees. Son in law Jennings agreed to a purchase price of $1,400. In the second deed of 1822, John and Catherine sold to Jennings some 19 acres as a portion of land known as "Skinner's Row" for the price of $100. The tract originally had been patented to Reuben and Sarah Skinner by the Commonwealth in 1804 and then conveyed to Samuel and Mary Skinner who in turn had sold the acreage to John Ream on Feb. 1, 1817. The real estate was bounded by the farm of James Tannehill and contained stands of white oak. Catharine passed away sometime during the seven-year span between 1822 and 1829. The details, and the site of her burial, may well be lost to history. When in the extensively researched 592-page reference book A Genealogy of the Stukey, Ream, Grove, Clem, and Denniston Families, authored and published by Elmer Leonidas Denniston of Harrisburg, PA, Catharine was not mentioned although her husband's two other wives were listed by name. By 1829, John had married his third bride, Elizabeth Smith ( ? - ? ), widow of John Smith. They apparently produced two more children of their own, Martha A. Ream and Sarah Ream. Another child, Mary Jane (Ream) Nicola, was involved, with her mother's name "Susan Nicola" circa 1865. This all needs to be sorted out. Elizabeth Ream's signature using an "X"
That same year, 1829, John and Elizabeth deeded 377 acres of farmland to the following nine grandchildren, the offspring of his son Samuel -- Otho Ream, Levi Ream, James Ream, Louisa ("Loiza") Ream, Henry Ream, Julia Ann ("Julian") Ream, William Ream, Mary Ann ("Maryan") Ream and Jacob Ream. The tract bordered the farms of Jacob Hartzell and William Ogg and others, and apparently had been sold or conveyed a few years earlier to John and Christina Nicholo ("Nicklow") and Robert and John Skinner. As stated in Reflections, "In a deed for 1830, John & Elizabeth sold land to Thomas Ream in Draketown. "Few additional details of Elizabeth's life are known to us. She and John are named in the book Genealogy of the Stukey and Ream Families. By sudden death like mine. John died leaving his wife with three daughters who were legally underage -- Mary Jane, Martha and Sarah. Jacob Rush was named as their legal guardian, and he continued in this role until the last of the daughters reached the age of maturity. On Dec. 12, 1863, Rush filed with the Somerset County court a final accounting of his activity as their guardian. John also passed without leaving a formal will. The task of administrating the estate fell to the widow Elizabeth, but she renounced the role in favor of John Hanna and Thomas Ream, and signed the document with an "X." An inquest was held at the widow's homeplace to determine the value of their real estate holdings. Somerset County High Sheriff Jonathan Knepper presided over the exercise in which a dozen "honest and lawful" citizens collectively evaluated the land to arrive on an estimated dollar value. The 12 men selected were William Rush, John K. McMillen, David King, Israel Rhoads, David P. Creamer, John Rush, Michael Sanner, Jonathan Mountain, Lewis F. Sanner, Steward Rowan, John C. King and Jacob Rush. Their conclusion was that the land and buildings were valued at $11.35 cents per acre but "will not conveniantly accomodate more than one of the children in the said writ named..."
The estate administrator collected cash debts owed by the following -- John Bell, Joseph Hendrickson, Otho Ream, Jacob Ramsparger, Peter Rush, Thomas Ream's administrator, "J. Hartzell of G.," I. May "by Sanner," Isaac Tissue "by Sanner" and Samuel W. Ream, totaling $1,708.25. Additional cash receipts came in later from former nephew John Minerd, Yankee John Younkin and Jacob Younkin Jr. The estate also paid $1,510.79 of its own debts, among other things to John R. King "for bringing coffin." An inventory was made of the Reams' possessions to determine their value. Among typical household and farm items were a German Bible, seven books of different kinds, two gross watches and much more. Elizabeth chose to retain the following items as her personal property -- stove and pipe, table, two chairs, delf plates, four cups, 4 saucers, two pewter places, two delf dishes and one coffee pot. She also kept a tin bucket, dutch oven and iron pot, lamp, bed and bedstead and spinning wheel. The remaining assets were sold, some 221 lots. Among others, the buyers included his sons and sons in law as well as former brother-in-law Jacob Minerd Jr. and nephew Henry Minerd, Jacob Younkin Jr., Garretson "Garrison" Smith and "Yankee John" Younkin. The fate of third wife Elizabeth is not yet known. In an interesting twist, showing migration patterns of Pennsylvania German families in Somerset County, John Ream's brother Samuel (1779-1858 - Find-A-Grave) is buried in the same cemetery in Perry County, OH as Catharine's brother Frederick Miner Sr. and her brother Daniel's first wife Mary. 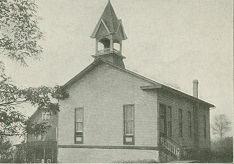 Samuel Ream and two of his brothers migrated to Perry County as early as 1801 and their names are included in the church organization papers of Zion Church in Thorn Tornshiop. A number of the Perry County Reams are profiled in A.A. Graham's 1883 book History of Fairfield and Perry Counties, Ohio. Over the ensuing decades after the Reams' deaths, the count of their offspring swelled into remarkably large numbers. For example, stepson Samuel produced 13 children and 79 known grandchildren -- stepson Thomas Ream Sr. had 6 children, 22 grandchildren and at least 80 great-grandchildren -- stepdaughter Mary Ann Weyand bore eight children and had at least nine grandchildren -- and stepdaughter Catherine Jennings produced three children and at least four grandchildren. Catharine (Minerd) Ream's name and signatures were located and copied by the founder of this website during a visit to the Somerset County Courthouse in May 2017. In 2017, the Reams' great-great-great granddaughter, Iva (Ream) Barkley, published a 284-page book about her extensive research, entitled Ream Riehm. A short description of Judge Baer is helpful in understanding his relationship with our family. He was born in January 1826 in Berlin, Somerset County, the son of Solomon and Anna Maria (Baker) Baer. He studied at Marshall College in Mercersburg, PA and clerked with Somerset lawyer Francis M. Kimmel and began practicing law in 1849. After 22 years, in 1871, he was elected judge of the 16th Judicial District covering Somerset and Bedford Counties. The Waterman, Watkins history says that he "came of a German ancestry, and by diligent study made himself master of the language so that he could write and speak it with ease and fluency. This, in a community where the German language was generally spoken, gave him another strong hold upon the hearts of the people..."
In the 1860s and '70s, while still in private practice, Baer bought the farms of John and Catharine Ream's nephews John Minerd (1864), Jacob Minerd III (1865), Charles Minerd (1868) and Henry A. Miner (1870) so he could obtain their mineral rights. When a discrepancy arose over the boundaries of one of the farms, Baer in 1871 obtained consents from a number of our cousins, including Joel Minerd, who did not own land but had a legal right as a Minerd heir. He went to Philadelphia in 1873 to attend the Constitutional Convention and is credited with writing Pennsylvania's Constitution. "In this select body fo eminent men he rendered services of a high order ranking among the hard working members as second to none," said the 1945 book Bench and Bar of Somerset County. He was elected President Judge of the 16th District in 1881 and served until retirement. In all, his holdings of Somerset County land totaled some 79,000 acres, and he helped found the Somerset and Cambria Railroad for the purpose of transporting local coal to outside markets. Said Bench and Bar, "He filled the high office with ability as demonstrated in the reviews by the Supreme Court of cases tried before him as he was rarely reversed." He died on Jan. 31, 1908. Judge Bear's biography (above) and photo portrait with fellow lawyers during the Civil War era, from the book Bench and Bar of Somerset County, Pennsylvania 1795-1945. 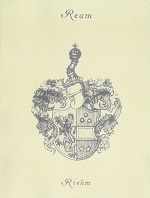 In 1971, Ursina celebrated its centennial as an incorporated town. Then, in 1997, it held a 125th anniversary. In 1991 and then again in 1992, vandals destroyed some 12 tombstones, "some over 150 years old," said the Daily American. Concerned descendants formed the Ream Cemetery Association and led a successful restoration effort, including building a new road. 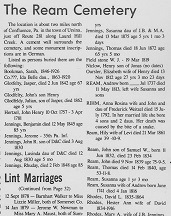 All the burials in the cemetery were listed in the August 1991 issue of the Laurel Messenger and in the Reflections booklet. 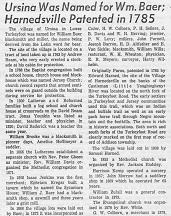 Articles over the years published in the Laurel Messenger of the Historical and Genealogical Society of Somerset County, clockwise from upper left: Feb. 1963 - Aug. 1991 - Nov. 1972.